Also, Suite for Orchestra; Variations for Small Orchestra. Anthony Armore, Janacek Philharmonic Orchestra. Navona Records NV6167. Canadian composer John Roberton has one of those names you'd swear you've heard before. When I first saw this disc, I thought for sure I had reviewed or at least listened to something by him in the past few years. Nope. Nothing. So, he was a completely new discovery for me. Interestingly, Robertson came to his present vocation relatively late in life. 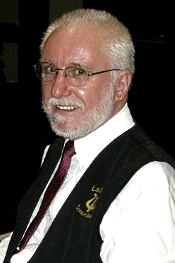 Although he was born in New Zealand in 1943, he didn't begin seriously studying musical composition until the 1970's and didn't hit it big until 1987 when he won a public performance in a composition competition for his Variations for Small Orchestra, Op 14. From then on, he has had his work performed internationally, and this is, I believe, his second recording, both of them on the Navona label. The album under review begins with an early piece, his Symphony No. 1, Op. 18, from 1988. Or 2014 if you like, since the work lay unperformed for twenty-six years when it finally debuted in Ruse, Bulgaria. Although the disc's booklet note describes it as "a somewhat somber work," I found it attractively accessible. It's in three movements that vary from serious to poetic to lighthearted. While the symphony begins a touch ominously, it soon enough takes us on flights of fancy and melody. Yes, actual melodies in a modern work, things often eschewed by modern composers for fear of being branded old-fashioned. There's even a segment for snare drum that is quite winning. A clarinet sets the stage for the slow second movement, which is graceful, lyrical, and vaguely elegiac. It's a thoroughly lovely few minutes. Then we get a final movement that recalls the first movement, beginning with the closing of the second movement's meditative violin solo and moving on to more sprightly and bucolic themes. While the symphony may, indeed, be at risk of being labeled a bit old fashioned, it provides a welcome respite for troubled times. The Janacek Philharmonic under conductor Anthony Armore play the music with a sympathetic eye toward lush, luxuriant sound, giving the music a handsomely polished air. It's all quite easy on the ear and soothing to the mind. 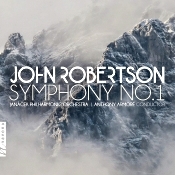 The second piece on the program is the newest, Robertson's Suite for Orchestra, Op. 46, which premiered as a complete work (various movements had debuted separately) in 2010. The section titles sum up its contents pretty well: "Fanfare," "Waltz," "Elegy," and "March." Like the preceding symphony, the Suite offers up some friendly and responsive tunes, including an intentionally "old-fashioned" (that term again) waltz, with a hint of Ives. The "Elegy" is a wistful affair, but the final "March" is a full-on example of its kind, played by Armore and his team with plenty of zest and bravura. The disc concludes with the aforementioned Variations for Small Orchestra, 1987. While it is perhaps not as accomplished as the later works and a little more disjointed, it contains a few charming cadences (with a delightful waltz in the finale) and its fair share of approachable themes. Executive producer Bob Lord and engineers Ondfey Danek, Jan Kosulic, and Jaroslav Zouhar recorded the music in the recording studio at the Concert Hall in Ostrava, Czech Republic, October 2016. They obtained quite a good response, the sound being among the best I've heard from any new recording this year, especially in the Symphony No. 1, which seems notably smoother than the others. The high-end clarity is outstanding; the midrange transparency is effortless; and the bass end holds up its part in the proceedings. One also hears a good dynamic response and a clear sense of orchestral depth, adding to the recording's sense of realism.